A well-trained theologian, a gifted and dedicated teacher of economics for over forty years, and the author of a highly regarded and widely-used textbook, The Economic Way of Thinking, Paul Heyne influenced generations of students of economics. Many of the essays in this volume are published here for the first time. 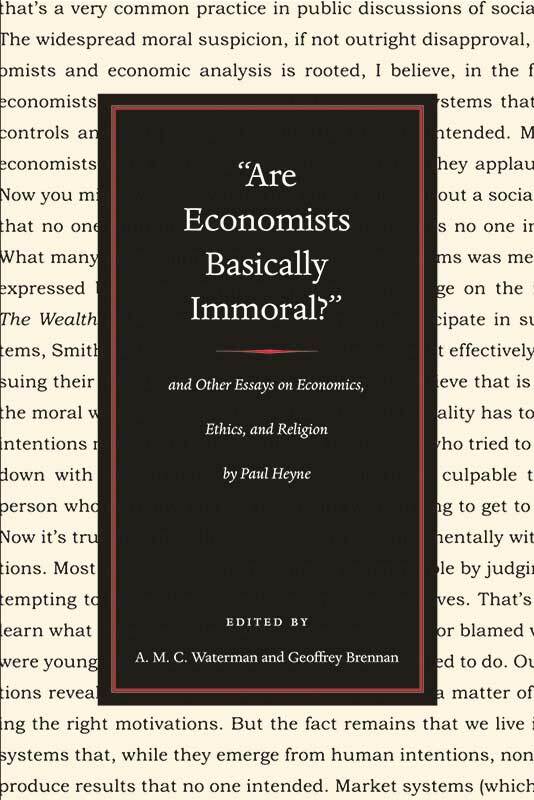 The editors have divided Heyne’s essays thematically to cover three general areas: the ethical foundations of free markets, the connection between those ethical foundations and Christian thought, and the teaching of economics—both method and substance. Paul Heyne (1931–2000) taught at Valparaiso University (1957–66), Southern Methodist University (1966–76), and the University of Washington (1976–2000). Geoffrey Brennan is a faculty member in the Research School of Social Sciences (RSSS) at the Australian National University, Research Professor in Philosophy at the University of North Carolina at Chapel Hill, and Research Professor in Political Science at Duke University. A. M. C. Waterman is a Fellow of St. John’s College, Winnipeg, and Professor Emeritus of Economics in the University of Manitoba.